Hey everyone! I hope everyone had a safe and enjoyable Fourth of July. Something that’s been on my heart for a while is Boldness for God. It’s something I believe we all struggle with especially with the different bombardments that come our way. I especially believe with the different events that are happening in the media with regard to police and African Americans that we need to stay near and close to God. We have to be bold for Him because we are inching near to the second coming. I just think of the verse that says the love of many will grow cold (Matthew 24:12) and that is what I am seeing, so many lives being lost all due to just sin and pain in this world. But we should be encouraged because this earth is not our home (2 Corinthians 5:1, 2Cor 4:18), and although we have grown attached to this place, one day we will be in perfect eternity with God. He will judge each and everyone of us and where some will be with Him forever others sadly will be in total isolation separated from God. Lets all aim to be ready for when Jesus comes again. Boldness: is our willingness to venture out and do the right thing at the right time, regardless of the barriers or fears we may encounter. This enables us to speak the truth, and perform a task without fear of the consequences or results, because, it is the right, and Biblical thing to do. It is realizing that God is in control. He is there within, and beside us, and He will take care of us. Therefore, we do not need to fear what others can do; rather, we are to concentrate on our character and call, and do it with passion and conviction. 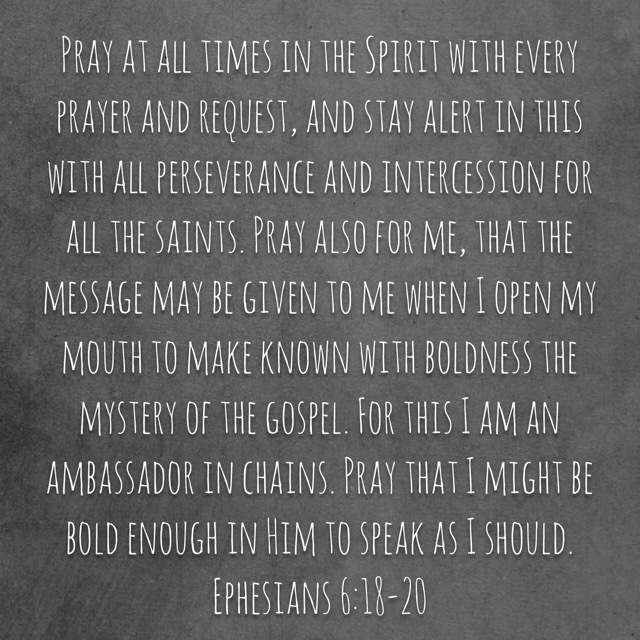 A verse that really spoke to me and I hope speaks to you about boldness is Ephesians 6:18-20 “Pray at all times in the Spirit with every prayer and request, and stay alert in this with all perseverance and intercession for all the saints. Pray also for me, that the message may be given to me when I open my mouth to make known with boldness the mystery of the gospel. For this I am an ambassador in chains. Pray that I might be bold enough in Him to speak as I should.” This verse just drives home the importance of being ready all the time, and asking God to help you be bold when the time comes. People in this world need the love of God, that is the only remedy/cure that anyone could ever give, because God is love. The following is a excerpt from a devotion on Boldness that I found uplifting. Hope you enjoy! The link to the whole thing is below! Acts 28:31 says that we should be proclaiming the kingdom of God and teaching about the Lord Jesus Christ with all boldness and without hindrance. The Bible tells us that as Christians we are to be a mirror image of God , that we should be a reflection of his joy, peace, and love everywhere we go. We may be the only chance that person seated near us will ever get to hear about how much God loves them. We should never miss an opportunity to spread the good news of Jesus. Go Into all the world the Bible says! We as Christians often think that this refers to the missionaries preaching in remote parts of the world and ministering to those in the secluded far corners of the earth. While that is extremely important, the man seated next to us in a lobby on a Wednesday afternoon is every bit as important to God. It’s no accident that we are seated near a certain person on a particular day. We all have divine appointments set up in advance by God. I challenge you and myself to live in boldness for God. Before leaving our houses, let’s ask Him to put someone in our paths today that needs to hear an encouraging word of hope. Be a blessing where ever we go and we will be the ones who are blessed.